" TropCrop really is a 'must-have' program if you need to be savvy quickly - for whatever reason - on cultivated plants in hot countries." " On missions to rural areas in the tropics, TropCrop on my laptop comes in very handy: great for reference, and - with these thousands of photos - great as a communication tool. And no internet connection needed! " See below for user licences for TropCrop. 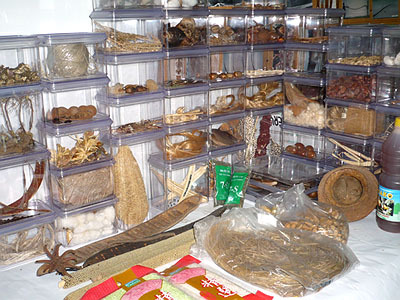 Main learning goals: recognising the 100 most important (sub-)tropical crops in the field and their harvest products on the market, and knowing what these crops and products are used for. How to use it: TropCrop is targeted for self-study as well as for use in tutored classes. Level: tertiary education (tutoring probably needed for use in secondary education). TropCrop has been developed, and is constantly updated and expanded in cooperation with the Department of Plant Sciences of Wageningen University, Netherlands. 'Getting to know 100 important (sub-)tropical crops in 11 commodity groups', courseware aiming at recognizing 100 of the most important crops grown in the (sub-)tropics from field characteristics (morphology, ecology, cultivation practices), and knowing what these crops are used for. 'MultiMedia Encyclopedia on 250 (sub-)Tropical Crops', a reference database and image bank of the most important crops grown in the (sub-)tropics, with [to date] 3554 photographs, 300 botanical drawings and 20 video clips. 'A quiz to test your ability to recognize 100 crops grown in the tropics and/or subtropics', an exercise tool for recognizing crop plants from photos proven to be very popular with students. 'A quiz to test your ability to recognise 77 seeds and other traded small parts of (sub-)tropical crops', a tough drag-and-drop-the-right-label game. 'A picture gallery on [to date] 391 crops grown in the tropics and/or subtropics', a selection of the most beautiful pictures from our slide archives and from tropical agriculturalists' private collections. 'A picture gallery on [to date] 60 ornamental crops/taxa grown in the tropics and/or subtropics', an expanding collection of slides on apparently popular non-woody plants, shrubs and trees you keep running into in gardens, parks and urban settings everywhere in the (sub)tropics. See the Crops page (130Kb) for an overview of all the crops and a taste of the type and quality of the photographs used. The self-contained modules of TropCrop are directly accessible via the XS2ALL programme-overview-annex-control-panel screen. TropCrop is stand-alone software. A web-based/on-line version is not available. The TropCrop programme is delivered as a download, or on a DVD or USB stick; it runs under Windows 95/98/NT/2000/XP/Vista/7/8/10. On a Mac, it will only run if a program like Parallels is installed (tested: OS X Yosemite 10.10.2 equipped with Parallels Desktop 8 for Mac). The web pages following this introduction are 1/4-size sample screen shots to give you an impression of the programme. Some of the buttons in the screen shots function as in the real thing: try them out! For information on user licences for TropCrop, see the contact info below. TropCrop is created by Rik Schuiling, agricultural botanist, tropical agronomist, and courseware developer who honed his skills at the Department of Plant Sciences, Wageningen University. His love for the natural beauty of the tropics, for traveling and for photography, in combination with his language skills and his eye for detail, not to mention his training and experience in agricultural science, has resulted in a truly special piece of educational software in which his enthusiasms clearly transpire: courseware that will inspire you and your students! 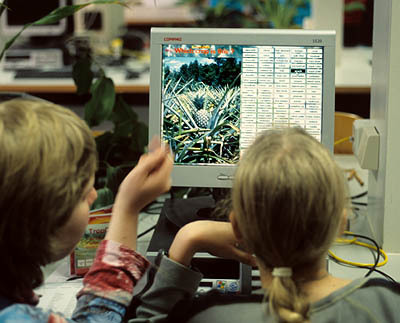 In 1993, the Department of Plant Sciences' former Tropical Crop Science section, at instigation of its professor Louise FRESCO, started to look into the possibilities of Computer-Aided Education for the lab 'Introductory Course in Tropical Crops'. This resulted in the TropCrop software. - the former Institute of Agronomy and Animal Production in the Tropics and Subtropics at the University of Goettingen, Germany (1996-1997). Most of the textual information and botanical drawings in TropCrop are taken by permission from the excellent handbooks and websites of PROSEA (Plant Resources of South-East Asia) and PROTA (Plant Resources of Tropical Africa) (1994-present). TropCrop has been constructed and is constantly updated using the superior authoring system IconAuthor 7.6. Single-user personal licence (indefinite period): EUR 37.50 (excl. VAT). For further information on the program and on the various other user licences for TropCrop, please contact us at info@tropcrop.nl. TropCrop - TCS fact finding, short field and desk studies on (sub-)tropical crops carried out for you, if need be on very short notice. TropCrop - TCS science photography, image services combining my photographic and (plant) science skills for you. TropCrop - TCS science editing, graphic designing and upgrading of your science communications (publications, reports, posters, flyers, extension fact sheets, etc.). TropCrop - TCS guest lecturing, providing courses on tropical crops using the TropCrop educational software and (optionally) the portable TropCrop exhibition.